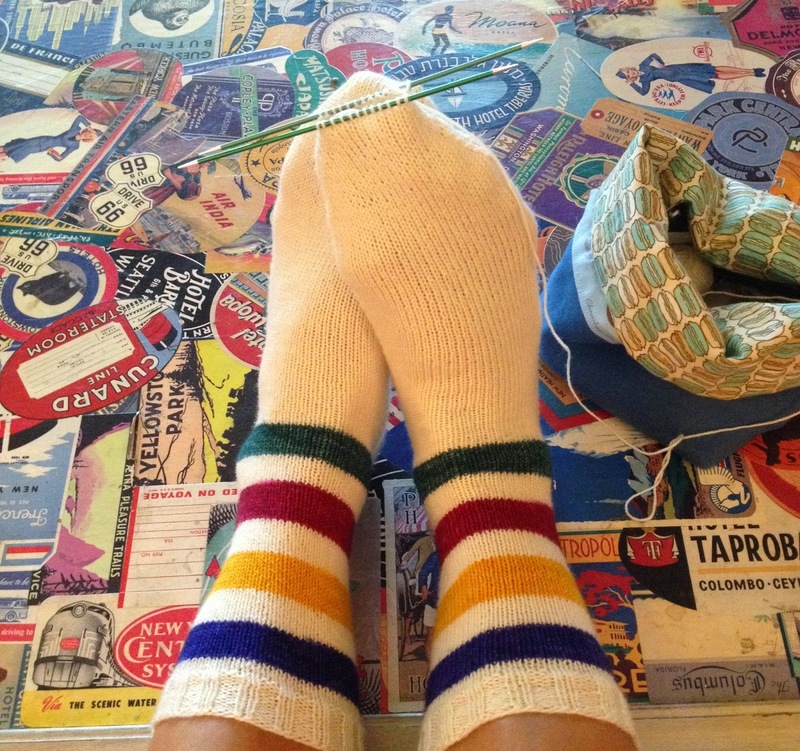 Susan B. Anderson: Sock Report ~ Hudson Bay Socks Finished and More Started! Sock Report ~ Hudson Bay Socks Finished and More Started! I have a quick sock update for you on this fine summer Sunday. This morning I finished up the toe on my Hudson Bay Socks and couldn't wait to slip the pair on my feet before using the Kitchener stitch to close up the toe. This is one lovely pair of socks. Pattern: How I Make My Socks ~ my free pattern! I have been in touch with Jo Dee, the dyer and owner of Fishknits Yarn, because I wanted to warn her to get ready for a lot of orders of Canadiana sock yarn. I had a feeling this one was going to be super popular. Over the last week or so she has sold way over 200 skeins of Canadiana (I'm sharing this information with Jo Dee's permission). It has been really crazy! Congratulations to Jo Dee. She is working hard to fill orders. Now I know I will get some questions about how this yarn works when you are knitting socks. It is dyed in an interesting way. Each skein is dyed to make two socks with one striping repeat on each sock. What I did was to get out my scale and I handwound two 50 gram balls, one for each sock. I did do a little shuffling around with the yarn at the top to get it to work the way I envisioned the socks. I started at the top of the cuff with white. I did a 2 by 2 rib for 12 rounds. Then I knit 4 rounds. Next I found the start of the blue stripe in the ball which was right toward the start so I didn't have to look far. I cut the yarn and added in the blue stripe. The rest of the sock was completed by simply knitting the rest of the ball. Then I just repeated this for the second sock. You could do toe up socks and just knit the yarn as is in the skein. The cuff will be quite long if you do it this way. The cuff on my sock measures close to 7-inches before the heel flap begins which is the perfect length for me. I do have some of the white sock yarn left over. Awhile back I heard about a new to me Etsy shop called Coloring Book Yarns. I think The Knit Girllls' Laura and maybe Amy Beth of The Fat Squirrel both used this yarn and I loved what I saw. When I popped on the Coloring Book Yarns Etsy shop there happened to be a couple of skeins available. I quickly purchased the SF Giants (on the left) and the BMO (on the right) colorways. I wound the balls in separated stripes. I have a video tutorial on how to wind like this right here. Click here to go to the Coloring Book Yarns Etsy shop! I see the shop is empty and there is going to be an update on September 5th. I don't know much more about it and if you have questions you'll have to contact the shop owner through Etsy. I put up the photo above on my Instagram and my Facebook and asked the knitters to vote on which sock yarn I should start next. The vote tipped toward BMO but there were lots of votes for the SF Giants colorway as well. For me the orange, black and white is more for Halloween not so much for the Giants. If you are wondering what BMO is click here. I still am not exactly sure what it is but people seem to like it. So when I was on a car trip last Friday I cast on the BMO socks! How cool is that striping pattern? What I really love about it is the use of the black stripes to outline the sections or color changes. Genius! The colors are really vibrant and stunning, too. Great work Coloring Book Yarns! Here it is a little further down the cuff, I'm still in the car here. See that gorgeous orchid colored bag? Here it is on the dashboard. I love this little project bag so much. I like the bright orchid fabric surprise on the inside. It is from Molly of A Homespun House podcast. I really enjoy her so much. Molly is from a little city right outside of Madison but now she lives in Berlin with her daughter and husband. I'm not sure if she's still sewing project bags. I bought this one through Etsy but it looks like Molly has a new website. You'll have to contact her if you are interested. I've had my project bag for awhile but this is the first time I've used it. The teacups are so sweet as are the polkadots. It is very well constructed. Click here for A Homespun House website! Check out Molly's new shawl. Molly just released a new shawl design called Whispering Pines. It is so pretty. I really want to knit this one up and soon. Great job, Molly! I can't wait to cast on. Isn't there so much fun stuff out there for all of us to enjoy? What a great and interesting world of talented people we live in. And they share! Have a wonderful weekend. I'll be back soon with more on #projectsweaterchest. I have some great ideas brewing. Super cool sock yarn. Your newest pair has an 80's vibe. Be cute to roller skate with them in gym shorts. Love those Hudson Bay socks. I got my skein I the mail yesterday and can't wait to start mine! I think I'm going to make them for my husband. We were just in Vancouver BC and drove by the Hudson Bay department store. I would love to have one of those blankets one day. Susan... Thanks for the great blog about socks... I'm wondering what happened to this gorgeous red socks with beautiful design you knitted and spoke about it on July 30, 2013 blog... You said you were working on the pattern but I haven't seen it available?? I haven't forgotten this beautiful sock and wanted to ask about it. I would love to purchase this pattern!! Keep the great work! Oh my gosh, you have a good memory. I still have those socks and never published the pattern. It is to have several different panel sections that you can choose from to put running down the sock. I just ran across my notes for that sock recently! I'll have to get back at those. For some reason I changed direction on that project. Hi. Wondering what pattern you used to do the BMO socks? I saw a post on ravelry How I Make My Socks..... is it that?